If the day comes when we’re all forced to drive EV’ s I’d definitely want this. The way the back is set up it looks like a cheap body kit, there is a lot I really do not like about it. Last edited by ICNU; 01-28-2019 at 06:02 PM. Very nice, a real looker! 2003 Boxster Base "First convertible"
Looks a bit like the Panoz Esperante from a few years back which I actually liked. What directionally appeals to me is that Porsche's design philosophy/language continues to be more on the organic side vs the angles/major air intakes, exaggerated side strakes et al. I like it though I can also see the body kit side to it. Read the article. It isn't a Porsche design in any way. 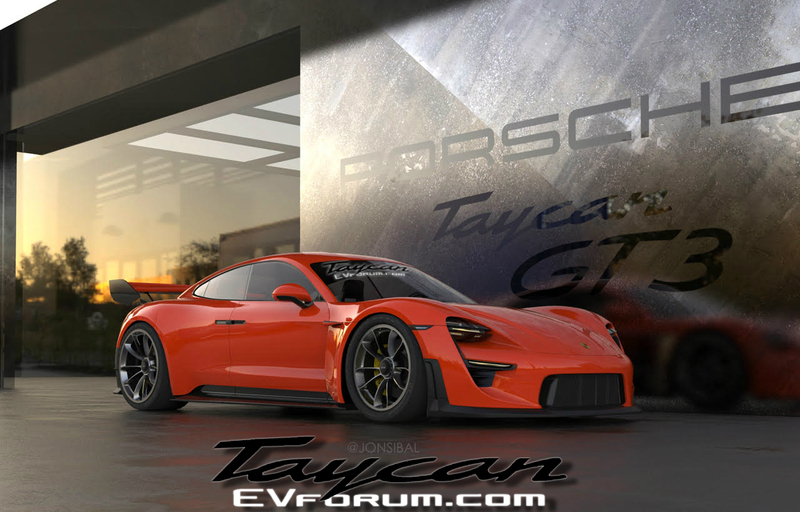 Just one artist's depiction of a stylized 911 using the Taycan concept as an excuse to stretch his imagination. Last edited by RSchwerer; 01-30-2019 at 05:49 AM. Sadly the Taycan will never look anything like this as it is a box based on the Panemera platform, the show car that was running around the circuits a few years ago was just that, a one-off show car prototype that bears little resemblance to the final product, which is unfortunate as we don't need another "box" car. Part of what makes it look like a kit car is that color. It screams "Bricklin". If you don't know what that is, well, Google it. They went the way of the DeLorean...in about the same time-frame. '06CS;ArcticSilver/Blk;PASM;SC;StuffedBose;NAV;GT2 seats;Udrive;PScooler;Mantissump;TTPOilsafe;PCCBms tr;HeigoRollbr;SchrothHrns;DMCHrnsbar;TPCswaybars; R.toelnks;SpdARTcatbck;Dmptrncs;SftrncsPlenm&4.1fl sh;18"MPSS/ChampionRG5;18"PirWntr/BxterS;18"NT-01/Forgestar;3frntgrills;GikenTBD... GONE! Now 911T...side stripe removed. Both the Bricklin and DeLorean were in an era where none of the big auto groups wanted no competition from 'forward' thinking car companies, although not implicated I am sure financing and part procurement was made very difficult by the mere suggestion from the Big 3! Today, there is all manor of boutique manufacturers, not commenting on the specific designs of either of those two cars (which was a long time ago), IMHO they would have had a much easier time today. Technology afford limited runs of almost anything that you wish to make today, back then if you couldn't sell thousands to get the cost per unit manufacturing down you were doomed. Just look at Koenigsegg, if he had to build 1000 example of each model he might be hard pressed to find that many buyers of what are basically $1M cars, but he doesn't have to or want to, he can do it with a very low volume of sales, neither Bricklin or DeLorean had that luxury do that back in the day. My point was nothing about mass production and price points of Bricklins. Bricklin was a stylish looking, in the way pop music of the time was stylish, POS that had terrible reliability and build quality. All that inconvenience and they weren't even fast. Same with Delorean. Mr. Delorean, in his drug-addled, over-priviledged, spending other people's money mind, thought the Delorean was going to be "the next Mustang". It was made of frikking stainless steel. This is not a cheap material nor is it easy to manufacture a car body from it. It had gull-wing doors... How's that ever going to play at an affordable price for middle America? Also, it had a little Volvo engine in it..and weighed a lot. You couldn't see out of it, it had no room in it and it was near impossible to repair if it got bumped. No way they were ever going to be big. Bricklin had some forward thinking concepts, but a lot of the same drawbacks as the Delorean. They weren't well executed and they ran out of money. GM didn't do it to them. Investors did it when the costs were triple the estimates and then warranty repairs started coming in. Delorean tried to do drug deals to raise money for his car. Went to jail instead. I think he was just over the fence. Both of these cars remind me of Fisker. It went under too. It's been revived under a new name. This is an expensive car with no room in it. Unlike the other two, it is pretty well made. Unlike the other two, it is beautiful..really beautiful. However, it weighs over 5000 lbs. There isn't much room in it. Seats 4 but none are comfortable. It's claustrophobic. The dash is a travesty. There is a small touch screen with ridiculous menus and sub-menus grouped in haphazard fashion. Unlike the others, however, it has some practical value as an actual car. It is also one of the most beautiful automobile designs I've ever seen. They are stunning...however...Too pricey for what it is, just like the others. It's pretty, but not particularly fun to drive...and if you break it?